Job Posting - Direct Service Professional/Life Skills Instructor - Eagan - ProAct, Inc. Serving people with disabilities for more than 45 years. 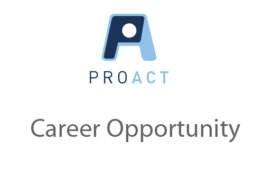 Job Description: The Direct Service Professional provides ongoing support to participants enrolled in enrichment programming and life skills classes. These supports are provided either at ProAct or in the community. Reporting and face-to-face counseling are also responsibilities of the Direct Service Professional. The Direct Service Professional also plans and prepares class curriculum/lesson plans. Teaches classes on a daily basis. Assists with behavior management plans. Completes all record keeping in a timely and accurate manner, including but not limited to consumer time cards, case notes, behavior observation charts, seizure logs, daily logbook, and accident/injury reports. Assists with consumer’s personal care needs including but not limited to toileting, feeding, food preparation/set-up, break room supervision, dressing and washing. Provides daily coverage for bus duty and lunch duty.